I'm heading to Malaysia for the first time, been meaning to go for years. I have over that time read a couple of great novels set in Malaysia - can't remember the titles for the life of me. Any suggested reads? Fiction and non-fiction both good by me, but should be available on Kindle as that's how I read these days. Weren't a couple of Somerset Maugham's stories set in Malaya ? The Long Day Wanes: A Malayan Trilogy by Anthony Burgess. No but I've time for a Leo! "The Jungle Never Sleeps" is a good read. None of the Malayan Trilogy seem available on Kindle. But I did get a sample of 'The Garden of Evening Mists', which I now remember I read a few year years back. Great read. Search for "The long day wanes"
Any personal recs among those, jof? 'My Life As A Fake' is partly set in Malaysia, and well worth reading. I also enjoyed 'The Garden Of Evening Mists'. 'The Long Day Wanes' is the cream of the crop, though. personal recs among those, jof? The first 2 books are good reads ciz. Into the heart of Borneo and Stranger in the forest......both about trekking through the jungle and the interactions with the native people. And how about anything written by Bruno Manser ? Though if you're in Malaysia already, it may still be a tad difficult to find anything by him, except on the net. Picked up Penang Adventure in ... Penang. Good read so far. Can't quite pin it down, but there's something in that title that suggests you could have done better. This does not qualify probably but Shamini Flint, Singaporean Inspector Singh Investigates: "Most Peculiar Malaysian Murder". Just an idea. It's quite a historical read - explains who's who in the creation of what is Penang today. Good, short read. Actually bought the book in George Town as opposed to buying it for the Kindle. Will try the Shamini Flint book, if available on Kindle. "The recipient of extraordinary acclaim from critics and the bookselling community, Tan Twan Eng's debut novel casts a powerful spell and has garnered comparisons to celebrated wartime storytellers Somerset Maugham and Graham Greene. 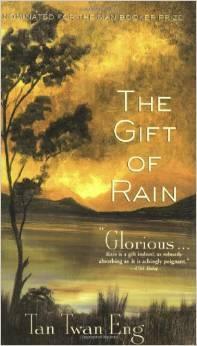 Set during the tumult of World War II, on the lush Malayan island of Penang, The Gift of Rain tells a riveting and poignant tale about a young man caught in the tangle of wartime loyalties and deceits. In 1939, sixteen-year-old Philip Hutton-the half-Chinese, half-English youngest child of the head of one of Penang's great trading families-feels alienated from both the Chinese and British communities. He at last discovers a sense of belonging in his unexpected friendship with Hayato Endo, a Japanese diplomat. Philip proudly shows his new friend around his adored island, and in return Endo teaches him about Japanese language and culture and trains him in the art and discipline of aikido. But such knowledge comes at a terrible price. When the Japanese savagely invade Malaya, Philip realizes that his mentor and sensei-to whom he owes absolute loyalty-is a Japanese spy. Young Philip has been an unwitting traitor, and must now work in secret to save as many lives as possible, even as his own family is brought to its knees." Also bought a very interesting book by a Malaysian-Indian ex-naval commodore, more like a collection of essays from his malaysiakini publications. Have a look for Little Wilson and Big God - a autobiography by Burgess. Describes how Anthony Burgess came to be. Gives a good insight into his earlier life, wartime experiences and married life and times in Malaya immediately after the war. Gives an explanation as to how the Malaysian Trilogy came about, too.